Supported by Key Program of Logistical Scientific Research of PLA (BHJ16J011) and Innovation and Cultivation Fund of Sixth Medical Center of General Hospital of PLA (CXPY 201729). Abstract: Objective To explore the effect of methylprednisolone (MP) with different durations on pulmonary fibrosis in rats with acute lung injury induced by smoke inhalation. Methods A total of 178 male SD rats were randomized into 5 groups:control group (n=18), simple smoke inhalation group (smoke group, n=40), smoke inhalation+ MP treatment for 1 d, 3 d and 7 d groups, naming smoke+MP (1D) group (n=40), smoke+MP (3D) group (n=40) and smoke+MP (7D) group (n=40), respectively. The rats were exposed to smoke for 30 min in the smoke box to meet the criteria of acute lung injury. MP (4 mg/kg per day) was injected intraperitoneally at 1 d, 1-3 d and 1-7 d after smoke inhalation. Survival rates were calculated at 28 d after smoke inhalation. At 7 d, 14 d and 28 d after smoke inhalation, the lung tissues were stained with Masson's trichrome staining and Sirius Red staining to evaluate pulmonary fibrosis. The mRNA expression levels of transforming growth factor β1 (TGF-β1) and α-smooth muscle actin (α-SMA) were detected by real-time fluorescent quantitative PCR, and the expression levels of myeloperoxidase (MPO), connective tissue growth factor (CTGF), high mobility group box 1 (HMGB1) and interleukin 6 (IL-6) were detected by Western blotting. Results The survival rate of the rats in the smoke group was 47.50%, and the survival rates were significantly improved to more than 80% after MP treatment with different durations (all P < 0.01). Masson's trichrome staining and Sirius Red staining staining showed that the lung fibrosis of the rats in the smoke group was aggravated, and the fibrosis and collagen deposition in the smoke+MP (3D) and smoke+ MP (7D) groups were significantly attenuated compared with the smoke and smoke+MP (1D) groups (P < 0.05 or P < 0.01). As time progressed, the mRNA expression levels of TGF-β1 and α-SMA after smoke inhalation were increased in the smoke and smoke+MP (1D) groups. At 28 d after smoke inhalation, the TGF-β1 and α-SMA mRNA levels were significantly higher in the smoke and smoke+MP (1D) groups compared with the smoke+MP (3D) and smoke+MP (7D) groups (P < 0.05 or P < 0.01). 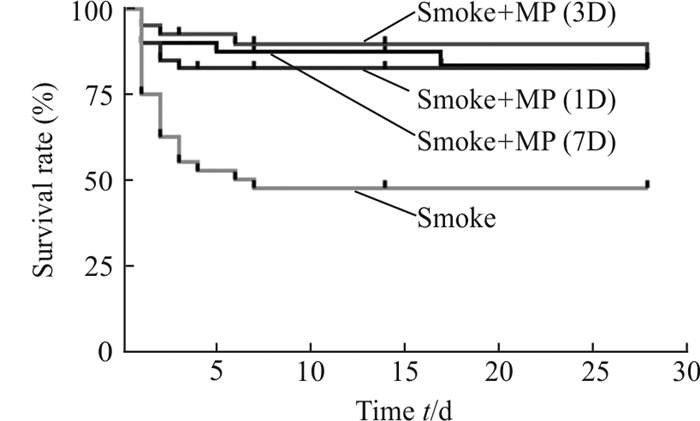 At 28 d after smoke inhalation, the protein expression levels of MPO, CTGF, HMGB1 and IL-6 were significantly reduced in smoke+MP (3D) and smoke+MP (7D) groups compared with the smoke and smoke+MP (1D) groups (P < 0.05, P < 0.01). However, the above indicators have no significant difference between smoke+MP (3D) group and smoke+MP (7D) group (all P >0.05). 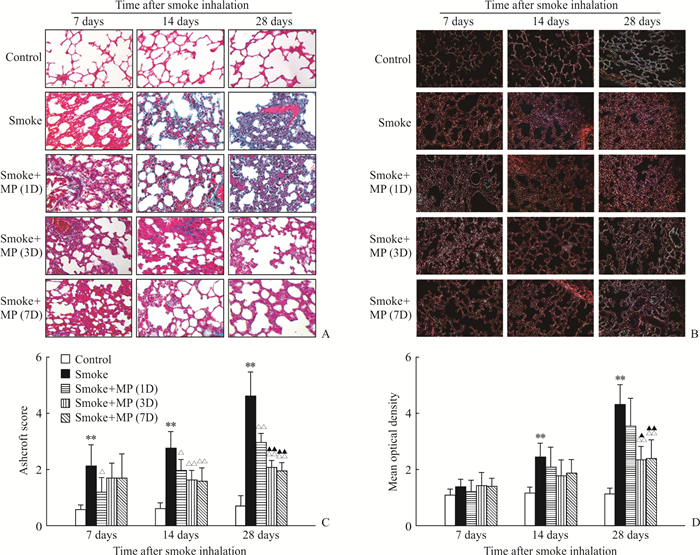 Conclusion MP can significantly improve survival rate of rats with smoke inhalation injury. MP treatment for 3 d or 7 d can significantly attenuate smoke inhalation induced pulmonary fibrosis at 28 d after smoke inhalation, but there is no significant difference between these two treatment protocols. ARORA S, DEV K, AGARWAL B, DAS P, SYED M A. Macrophages:their role, activation and polarization in pulmonary diseases[J]. Immunobiology, 2018, 223(4/5): 383-396. THOMPSON B T. Glucocorticoids and acute lung injury[J]. Crit Care Med, 2003, 31(4 Suppl): S253-S257.